For human people, the benefits of dropping a waist size or two are legion: More stamina, better sleep ... and fitting back into your college jeans. Cars are similar. Though the biggest difference will show up at the pump (hey, more $$$ for that new paint job), lighter vehicles also are just way more of a blast to pilot. Since the way driving feels matters a lot to Mazda, the carmaker put its entire 2016 model-year lineup on a diet. And it’s working. Steel is a great car-making material. But it’s not particularly lightweight. So with upcoming federal fuel economy standards in mind (54.5 mpg by 2025), Mazda has been going deep on replacing regular-old steel with thinner and lighter high-tensile-strength steel and aluminum wherever it can. In the Miata, the carmaker was able to build the hood, trunk, front fenders, and bumper reinforcements out of aluminum. And in its 2016 lineup as a whole, Mazda’s new SKYACTIV body contains a third more high-tensile-strength steel than last year — 60 percent overall — which accounts for a body that’s both 8 percent lighter AND 30 percent more rigid. While it makes sense that a hood constructed from aluminum or a body made from high-tensile-strength steel would make a big difference, it’s less intuitive how tiny bolts or a slightly thinner engine-block cover could ever add up. But every gram matters. Take those bolts: Mazda recently started using a new reverse Torx head, which allows a lighter version to be used with a standard 10mm socket wrench, saving 8 grams per unit. 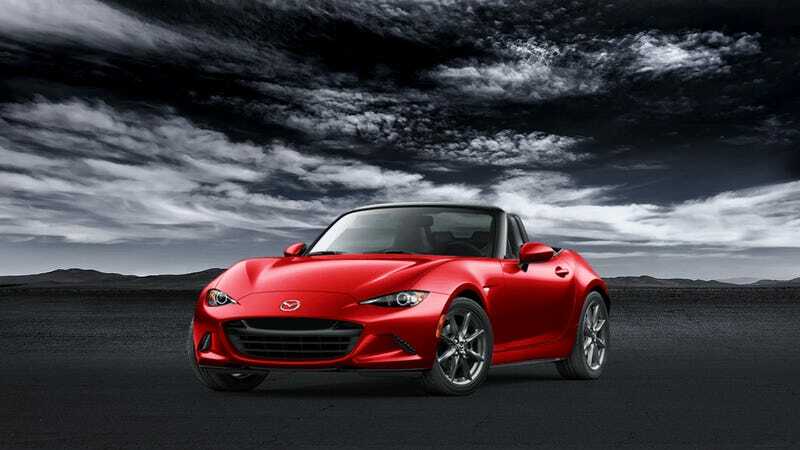 Or the engine block: In the new Miata, it dropped 24 lbs., weight savings which came in part from a front cover whose thickness is 2.0mm vs. 3.2mm in the third-gen model. Well, not *full* MacGyver; the new Miata contains zero percent chewing gum, straightened-out paper clips, or disassembled ballpoint pens. But they did do some awesomely clever stuff like swapping out the stereo speaker magnets in the doors (of all models) with lighter-weight neodymium; replacing some welds with high-strength adhesives (again: not chewing gum); and modifying the driver’s seat so that, when you slide it forward, its angle also increases by 10 degrees, which allowed engineers to do away with the seat-lifter mechanism. BOOM. All that — and more — is how Mazda was able to cut some serious lbs. from all of its vehicles, as well as precisely 148 lbs. from the 2016 MX-5 Miata. Photos by Frontierofficial (giraffe), frame.fusion (Setter), and Scott Calleja (eagle).